The MOOSE & THE GOOSE: Exclusive FOOD ADVENTURE EVENT Feb 22nd !! Get your tickets now, because THE BIG RAGU & Crew have done it again. Along with DaytonMostMetro they have put together another one-of-a-kind, one night only extravaganza called “THE MOOSE and THE GOOSE.” This time we team up BULLWINKLES TOP HAT BISTRO and GOOSE ISLAND BEER COMPANY for and incredible 5 course dinner with 5 beer pairings ! COST: $30 per ticket -INCLUDES GRATUITY !! Tickets are limited, and once they are sold out, THEY ARE SOLD OUT ! WHAT ELSE: DOOR PRIZES, SOUVENIRS, GIVEAWAYS, and the GOOSE ISLAND GIRLS ! Who knows what other surprises are in store !! TICKETS ARE ONLY AVAILABLE HERE AT THIS LINK and WILL BE WAITING FOR YOU AT THE FRONT DESK the night of the event ! Don’t miss this exclusive FOOD ADVENTURE EVENT with THE BIG RAGU & CREW !! Food Adventures Takes Aim at Archer’s + $20 Gift Certificate !! You have driven by and seen the packed parking lot, so you know something is up. Archer’s Tavern has just surpassed its 3rd year in business and is still cookin’ right along in more ways than one. Owner’s Dan Apolito, Scott Dorsten and Mike Fullenkamp have a great formula for success. Good food, good drink, and affordable prices. The owners also immerse themselves in the community, donating to various churches, charities and youth organizations. The belief is “If you do good things for people, it will come back to you.” The menu, which is printed on newspaper, keeps customers coming back for sure. Archer’sm, located at 9496 Dayton Lebanon Pike, is a family pub-style restaurant named after John Archer Jr. who owned Centerville’s first tavern. This nod to history is true to form with ownership’s belief in local involvement. From Burgers and Pizzas, to Salads and Craft Beers, there is something for everyone at Archer’s Tavern. Don’t forget the special events they showcase from time to time. — Family Friendly Atmosphere with a pub feel. You could bring the kids here after a soccer game, or sit at the bar with some friends. — Great Craft Beer selection on tap and in bottles. Archer’s partners with regional breweries for some rare, delicious selections. Their rotating selection is sure to please thirsty patrons. The Brandon Burger features Zink’s Local Beef , a fried egg, and bacon on top. 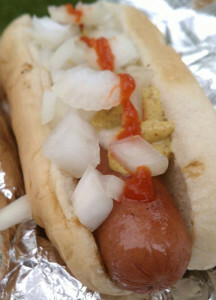 — Affordable meals with most selections in the $7-$10 range. They even have a burger for under $4. — Don’t miss their special events throughout the year. Whether it is a crawfish boil to celebrate their anniversary or a beer/menu tasting featuring Goose Island beers, these events are worth checking out. Stay tuned to their website and Facebook Page to keep up with the latest happenings. Here is EXCLUSIVE SCOOP on the next upcoming event ! Archer’s will feature a CHILI COOKOFF on Saturday, September 14th from 2pm-4pm. Do you have a winning recipe? Limited to 20 entrants, the winning person’s chili will be featured on the Archer’s menu for an entire year. There is also a cash prize of $200. To enter the contest, stop into Archers Tavern, but do it quickly as space is limited to the first 20 entrants. Food Adventures will be celebrity judges and you can be a judge too! Just show up the day of the event and pay $10 to sample the 20 chili entries and cast your vote. Join us for this FOOD ADVENTURE ! The money collected will go to the Centerville High School Culinary Student fund or the Archer’s Scholarship Fund. Again, Archer’s is giving back to the community. We love and respect that. With so much going on in this place, we offer up our suggestions on some of the best. As with all of our Food Adventures, we have been here numerous times and tried almost everything on the menu. If you have not yet been to Archer’s, let Big Ragu, Chef House and Hungry Jax point you in the right direction. — THE BRANDON BURGER: This burger is a favorite. 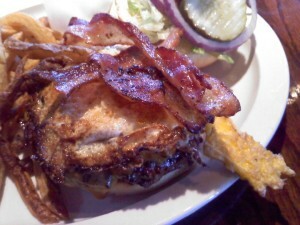 It features a fried egg and bacon all on top of a fresh Zink’s Meat Market Burger. It is quite simply one of the best burgers in town. 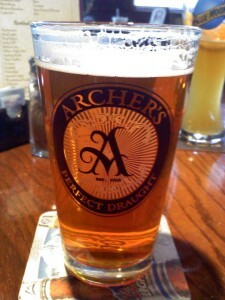 — ARCHER’S ALE: An ESB (Extra Special Bitter), that is an original craft beer. A quality brew to be appreciated by the beer connoisseur in you. 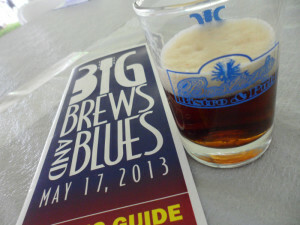 Smooth and easy, this is an enjoyable drink for those ESB lovers. — CITRUS CHICKEN SALAD – Grilled chicken on a bed of fresh greens, mixed with a balsamic dressing. Other toppings include mandarin oranges, cranberries, bleu cheese crumbles and almonds. A healthy and tasty alternative! 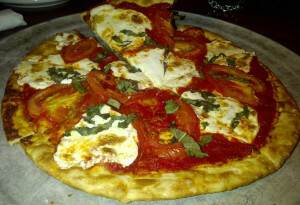 — THE MARGHERITA PIZZA: Fresh Mozzarella and a smooth tomato sauce is the key to this pizza. Fresh basil leaves and Roma tomatoes top off this vegetarian pie nicely. — THE PHILLY CHEESESTEAK: A heaping sandwich filled with meat, peppers and melted provolone cheese. You can also request cheese whiz on this monster. We say, go for it. This is how they do it in Philadelphia. Your choice of ribeye steak or chicken for the meat. — CRAZY UNCLE JESTER’S HOT SAUCE: Archer’s is partnered with a local hot sauce maker that really lights things up. Make sure and ask your waitress to bring out some different flavored bottles of Crazy Uncle Jester’s Hot Sauce. Add it to some wings, chili or whatever you want to pack a wallop of flavor. Good stuff here, some of it isn’t for the squeamish. Finally, this article would be incomplete if we didn’t talk about the servers. Our many experiences have shown us that this friendly staff cares about the customers and shows commitment in offering good service. The management instills this belief from the top down. If you love decent prices for good food, then give Archer’s Tavern a shot. This place is about relaxing in a fun eatery. Our advice is, scan the beer selection, order a burger or one of our ‘must eats’ and then… enjoy. In this Food Adventure, you can be sure that Archer’s will hit the bullseye ! Browse through our photo album of literally dozens of menu items and features from past special events. Are you a Foodie? Then “like” Food Adventures on Facebook HERE ! $20 GIFT CERTIFICATE CONTEST !! When the first Goose Island Brewpub opened its doors in 1988, domestic, mass-produced beer was deeply ingrained in Midwestern culture. The craft beer industry was still in its infancy, with only a handful of brewpubs in existence in the Midwest. In his travels across Europe, beer-lover John Hall had enjoyed a distinctive local brew in each region he visited. Hall was convinced that Midwesterners could produce beers as good or better than those he’d tasted in his travels. Living on the shore of the largest system of fresh water on the planet Earth, in a city with rapidly evolving tastes – John decided that his hometown, Chicago, would be the ideal place to do just that. On Wed, Aug 11th starting at 7pm you’ll have the chance to check out half a dozen of their latest craft brews at The Caroline, on the square in downtown Troy. Goose Island 312- Densely populated with flavor, 312’s spicy aroma of Cascade hops is followed by a crisp, fruity ale flavor delivered in a smooth, creamy body. 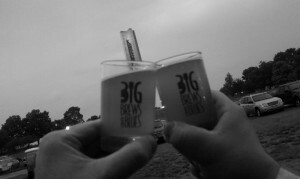 This gives 312 a balance of flavor and refreshment that never fills you up and won’t let you down. Sofie-Fermented with wild yeasts and aged in wine barrels with orange peel, Sofie is a tart, dry, sparkling ale. A subtle, spicy white pepper note, a hint of citrus from the orange peel and a creamy vanilla finish make Sofie an intriguing choice for Champagne drinkers and beer drinkers who are fond of Belgian Saisons. Fleur-A Belgian style pale ale blended with hibiscus and kombucha tea, Fleur is a beautiful, rose-colored ale with an aroma of strawberries and hibiscus flowers. Her flavor balance starts with a hint of sweet, ripe berry and finishes tart. Demolition-Brewed to honor the brave souls who kept our brewpub open in the early 90’s while wrecking balls tore down the mall around us. Dry and smooth, with a grassy, citrus aroma and honey malt middle. Matilda-Wild in character, with a slightly fruity aroma and a spicy yeast flavor that is as unique as it is satisfying – Matilda is an intriguing choice for beer and wine lovers alike. Dry and quenching, it’s the perfect accompaniment at the dining table or for casually socializing at the bar. Pere Jacques-Brewed with loads of malt and Belgian yeast, Pere Jacques is a wonderfully fruity, malty ale. Pere Jacques’ complex flavors stand shoulder to shoulder with the Belgian Dubbels enjoyed in the world’s finest beer bars. At the dining table it’s the perfect alternative to a glass of vintage port. The cost is attend is $17.50 per person and reservations are requested. Tasting are set up family style, with appetizers passed in a casual, relaxed atmosphere. Call Steve or Carly at 552-7676 to hold your spot.